Odense, Denmark, December 5, 2018: When Linatex, a Danish supplier of technical plastics and rubber for industrial applications, bought a UR5 robot arm from Universal Robots (UR) to automate CNC machine tending in December 2008, they did something unthinkable. Instead of installing the robot behind safety caging, fenced off from people as was the norm for all industrial robots, they deployed it right alongside their employees. And instead of bringing in external programmers to master complex scripting, Linatex was able to program the robot on their own with no prior programming experience. 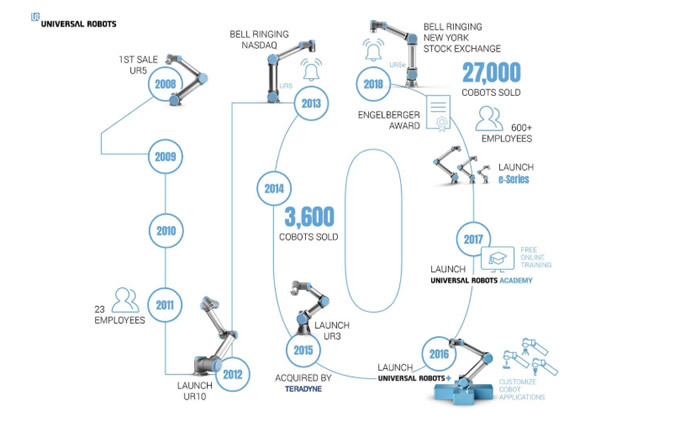 Today, ten years later, Linatex still uses a cobot from Universal Robots.